Backing it up after a gargantuan Two Room Carnival Special – we bring you DUTTY DANCING SOUNDCLASH! Three heavyweights put their over inflated DJ egos on the line as they compete for your affections. Playing bite sized power sets brace yourself for an explosive night of non-stop wining. Sydney’s DANCE CENTRAL will be performing live. Giving you a live demonstration the latest Dancehall moves. Wave your flags, bring dem whistles and don your diamond encrusted festival mask as Dutty Dancing celebrates Spring with a full venue Carnival. Taking you to Trinidad & Tobago for a charged up Soca Power carnival experience. Expect drums, feathers, whistles and masks! Follow us down the ayahuasca rabbit hole as they cover all tings tropical from dembow classics to acid infused afro vibes, latin heaters all the way through to undiscovered Brazilian & Portuguese bombs. A producer who has worked with Jennifer Lopez, Tkay Maidza, Diplo and Swick with deep crates of global club burners. Full venue, big vibes, large line up, proper sound, Caribbean dance showcases & free carnival whistles on arrival for the first 50 through the door. Come one come all. Dress to impress in your finest Carnival inspired attire to win a bottle of sparkling! Ring di alarm! Sydney’s most outrageous dance competition has returned! Bare witness as some of our city’s finest dancehall dancers compete for the highly coveted Dutty Dancing Gold Rope. 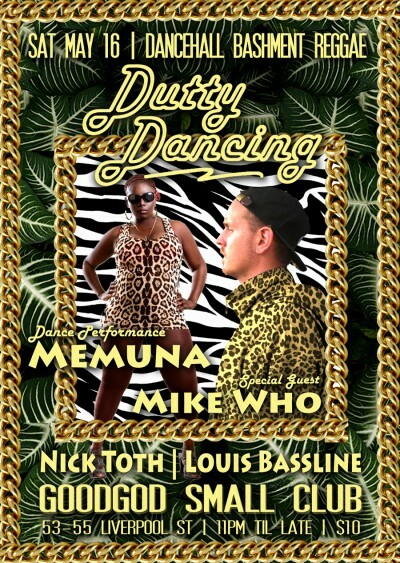 Dutty Dancing has a reputation for showcasing some of Sydney’s finest Dancehall dancers. This month will be no exception. A legend of the Sydney Dancehall scene, Memuna has performed at countless events working with the likes of KillaQueenz and Dance Studio 101. Our guests will join our residents NICK TOTH and LOUIS BASSLINES in a night that will have your gyrating into the early ours.